Two Rivers Brewing Company of Easton has announced that they will be opening up shop in the coming Trolley Barn Public Market in Quakertown. The market and beer garden will include a more than 9,500 square foot outdoor garden with a game area and a covered pavilion. Headed up by developers Chris LaBonge and Ian Jeffrey, the project is expected to take a year to a year and a half to complete. 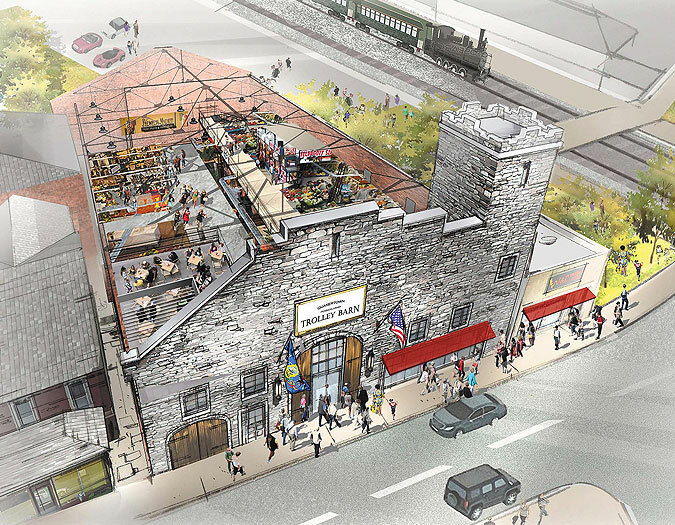 The property will include the current J&D Whistle Stop and the 15,000 square foot trolley barn. With renovations totaling over $4 million, the borough is realizing a project that has been over a decade in the making through the town’s revitalization efforts. The market, billed as an indoor, year-round marketplace, is modeled after the Easton Public Market and will include provisions from local farmers including produce, meat, dairy, bread, and more. The market plans on hosting kids activities, demonstrations, cooking classes, and other events. Also announced for the market is Black River Farms of Bethlehem, who recently joined the Lehigh Valley Wine Trail and is adding a tasting room at the new market. The market is still looking to add a deli, sushi bar, bakery, artisanal pizza shop, and a distillery.